There’s something to be said about mall comic shops – and those words aren’t necessarily good ones. Still holding an important niche in the world of “collectors,” the mall comic shops, generally, are the poor cousin to the local neighbourhood comic shops. They are filled with high school mallrats drinking biggie-sized Cokes through whistling straws, pawing and pulling at Warhammer game boxes, their heavy, textbook-filled backpacks thrown roughly over unsold back issue bins of horrible X-Force and Youngblood comics, an acrid scent of dust and decay in the air. Now, I don’t have anything against Warhammer or backpacks. I’ve had a hand in both of those items in the past and at one time, I too was in high school. If you look through my collection of comics, you may even find a copy of X-Force #1, buried in a litany of miscellaneous rubbish. The problem I have is that mall comic shops cater to kids with twenty dollar weekly allowances. To stay in business, they require sales in volume. They are forced to stock their shelves with affordable packs of magic cards, hero-click figurines and manga magazines. They have gumball machines at their entrance to entice children and they’re cramped spaces with books and boxes falling over themselves, as they utilizes every bit of square footage to maximize display space. Like I mentioned earlier, I’m a fan of the bookshelf display. At any comic book shop I frequent, I need to see hardcover books in numeric and alphabetical order. I need to see them separated by publisher. In this way, I know that I’m in a store managed by someone who knows their comics and cares about them. On this particular day, at this particular hour of the evening, the mall comic book shop presented its one important attraction: it was open and it was close and that was all that mattered to me. A heavy foot on the pedal found me at my destination in no time. It had been a while since I had last been to this particular mall in suburban Toronto. In my haste, I parked at the first free space I could find – just wanting to race in, pick up Batman #681 and then race home. Of course, I parked at the wrong end of the lot. I couldn’t have been any further away. I made my way through the twisting tunnels of the mall at a near gallop, racing down an escalator, meandering through wayward shoppers, a lost audience to a number of “60% off” advertisements. Me? I was focused. I was as determined as a hawk swooping down on a field mouse. Left and right hand turns were made seemingly automatic. Finally, one last turn and I made my way into the store, ushering my way through a crew of after-school kids fawning over something manga-related just to find myself staring at an empty shelf. “We sold the last copy hours ago,” the clerk said. “The school kids were here at lunch and picked them all up.” Somewhere behind me, someone sipped the last bit of their biggie-sized Coke through a straw. “So…does he die?” I asked. “Do you really want to know?” The reply was one last siren of temptation, mischievously imploring me to steer my ship towards rocks. It was my second death this day. What did it matter now? Still, something shook my desire for surprise. No. No dashing upon craggy cliffs for me. 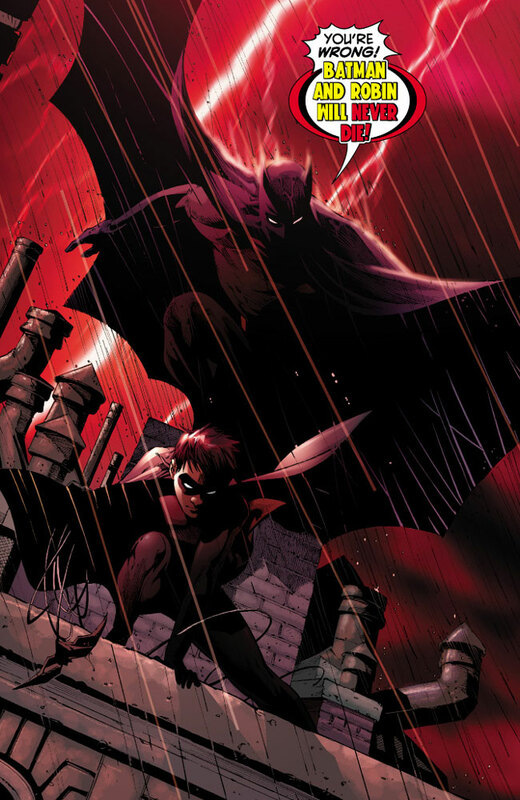 I’d waited too long to find out the answers of Batman R.I.P.’s epilogue. Perhaps I wasn’t meant to read the comic today. Instead, I’d pick it up tomorrow. I’d wait, but I’d be surprised. I’d be satisfied with an eccentric sense of dignity. Temporarily defeated, I walked back through the hallways of the mall, back into the cold November night. The long walk seemed fitting in some Greek-tragic way. I texted Andy B on my cell phone to share my defeat and my disappointment. Halfway home I received his reply. Yes! The shop downtown! They would have ordered a whole boat-load of copies. The clock on my dash flashed the time. It was only 8:20 pm. Toronto traffic is notorious. No matter what direction you’re headed, you never know what you’re going to get but I thought that if there were no accidents on the highway and I made all the right turns and found a quick parking spot, I’d be able to make it in and out of the comic store before they closed at nine. My sails unfurled again and a strong wind filled them, pushing me at (nearly) 120 km an hour, steering me downtown, directing me towards a deserved comic book triumph.